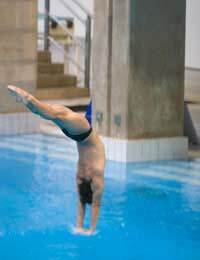 Greg Louganis is the greatest diver of all time, but is best remembered for striking his head on the springboard during the 1988 Olympics in Seoul. As he attempted a reverse two-and-a-half somersault pike in the penultimate round of qualifying, Louganis hit the back of his head on the board and fell clumsily into the water. The American received stitches to his scalp wound and, 35 minutes later, resumed diving. In his autobiography, 'Breaking the Surface', Louganis said: "I was underwater before I realized that I'd hit my head. Once I did, the first emotion I felt was embarrassment. This was the Olympics, I was a gold medallist, and here I'd gone and hit my damn head on the board. I'd had accidents before, but never at the Olympics." Controversy followed in 1995 when Louganis announced he had AIDS and had been HIV positive at the time of the Seoul Games. He was criticised for failing to reveal the fact after striking his head on the springboard, and admitted he was deeply concerned for his fellow athletes. "All kinds of thoughts raced through my head. What if I cut my scalp? What if I'm bleeding?" he said. "I was in a total panic that I might cause someone else harm. It was sheer terror. I didn't even pause to think that I might be badly injured." Louganis, born to parents of Samoan and Swedish ancestry, was adopted by Peter and Frances Louganis at nine months old and grew up with asthma and dyslexia. He made his Olympic debut at Montreal in 1976 as a 16-year-old and won silver in the 10-metre platform behind Italian legend Klaus Dibiasi, a three-time Olympic champion. The USA boycott of the 1980 Moscow Games in protest at the Soviet invasion of Afghanistan robbed Louganis of the chance to add to his medal tally. He had won the 10m platform at the 1978 World Championships in Berlin and would have started favourite for both the platform and springboard titles in Moscow. At the 1992 World Championships in Guayaquil, Ecuador, Louganis became the first diver to get a perfect score of 10 from all seven judges in a major international meet. He won the diving double of platform and springboard and defended the titles four years later in Madrid. On his return to the Olympic arena, at Los Angeles in 1984, Louganis became the first man to win double diving gold since American Pete Desjardins in 1928. The margins of victory were colossal. In the springboard he scored 754.41 to win by 92.1 points and he won the platform by 67.41 points with 710.91. Four years later in Seoul, Louganis overcame his collision with the springboard to retain both titles and in doing so became the first man to achieve the double at two Olympics. Fellow American Patricia McCormick had achieved the feat in the women's events in 1952 and 1956. Louganis scored 730.80 to win the springboard title by 25.92 points. The platform title was in the balance until the last dive. Louganis performed a reverse three-and-a-half somersault and edged out China's Xiong Ni by 1.14 points with 638.61.